"The end result? The Conjuring is fine, but like Insidious, while it may have its terrifying turns, it won't stick with you forever—or even overnight." Finally, a movie about pop Catholic mythology that attempts to explain the theodicy behind a nominally omnipotent, nominally omnibenevolent God, that nonetheless lets other supernatural entities venture onto the material plane, manifest greater power within this world than I Am has been witnessed to wield since Old Testament days, and eat innocent people's souls, fundamentally contradicting basic Catholic soteriology: yeah, so I saw Prince of Darkness for the first time last year, and it was amazing. But The Conjuring? The question of divine justice is never considered. Instead, just accept that Movie Catholicism is objectively true, and if you're not Catholic, your best bet is finding some kind of freelancer for all your exorcism needs, although honestly it's probably the reason you're under attack by demonic forces in the first place, heretic. The closest nod to the idea that any religion other than one involving strict obeisance to the Bishop of Rome may be valid is nothing more than a brief line. A character, meant to be wise, has done a title search on this haunted house movie's specifically afflicted piece of real estate, tracking it back to just about pioneer days. One Satan-worshipping owner, she says, had picked up the family trade of an ancestor, who had been executed back in the 17th century, during this pretty obscure event in Massachusetts which she namechecks without comment, but that you probably haven't heard of. 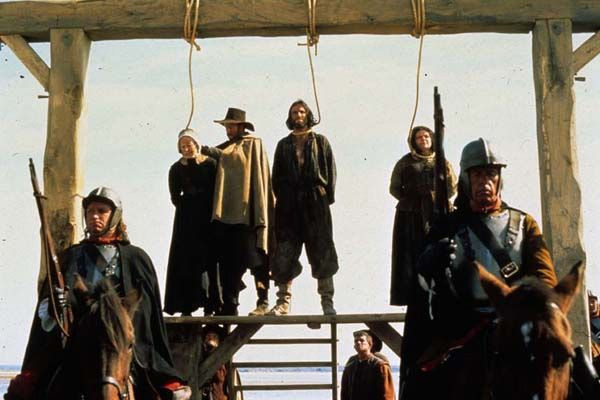 So Puritans: also maybe OK, so long as they're doing God's work, which is to say, hanging and pressing random innocents lawfully adjudicated witches to death. Pictured: just a bunch of pro-witch propaganda. Probably soft on commies, too. Let's get it out of the way: James Wan's new film is an effective frightener, but flawed. The Conjuring is an intensely religious horror movie that is also happy to dismiss the twenty judicially-sanctioned murders in Salem and by extension thousands of similar crimes in Europe with one throwaway line of dialogue. But none of this is its fundamental problem. Set in the funky 70s and based on a totally true story, The Conjuring's protagonists are the Witchfinders General themselves, haunting experts Lorraine and Ed Warren. A brief prologue features one of their adventures into the supernatural, their expertise pitted against the terrifying doll featured in the trailers and sparingly used, but not wasted, in the narrative proper. This prologue also introduces their trophy room, missing only a giant penny with the Joker's face on it. We come to learn their experiences have worn them down, and that they're close to calling it quits. "What? Is it a bee? Don't even tell me if it's a bee." 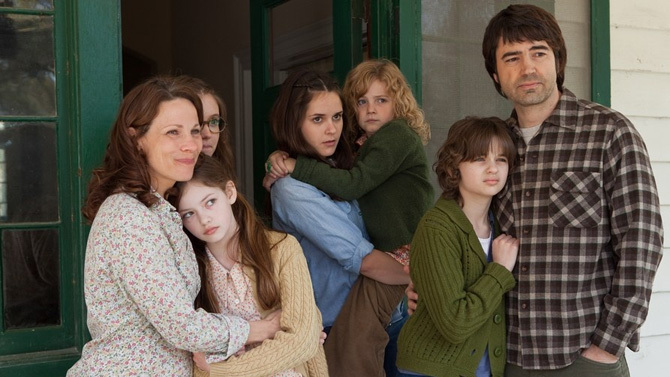 The Conjuring's victims are Carolyn and Roger Perron and their almost Jethro-level multitude of daughters, what demons likely call a "target-rich environment." The Perrons buy a near-mansion of a farmhouse at an estate sale, but bad things have happened here, bad things will happen again, and in true 21st century horror movie fashion they cannot afford to leave. Roger Perron, however, considers abandoning his family by Post-it note, if only they had been invented yet. The ghastly entity within the house rapidly makes its presence known to all and sends the Perrons running to the paranormal professionals nearest them. Like someone somewhere must have said, "Just one more job and we're out." The Conjuring is at its most effective in its early sequences, segueing expertly from the initial poltergeisting into its primitive ghost hunter mode, with the Warrens' team gathering documentation of the demonic presence so that they can send their application packet off to the bishop's office for Church assistance. Acting is top notch from the entire cast, including the kids, though one must concede that no role calls for as much raw performing prowess as did the best haunted house movie of recent, if not any, times, Scott Derrickson's 2012 Sinister. That's okay. These are not simplistic characters, per se, but instead best described as transparent. So transparent that perhaps only sixty to eighty seconds of this movie is spent between them in questioning whether there's some kind of supernatural force at work. This is a departure from what's become the standard haunting narrative, to be sure, and is one of the freshest aspects of this movie. I also liked it very much when the plat books get brought out Chinatown-style. I've always wondered what happens to a house of the devil when the legal definitions of the property change. Unlike most easements in gross, I already knew such demoniac servitudes always run with the land. Turns out the right of way through your soul extends to any subdivisions, too. Of course this free-roaming vapor isn't likely to be bound by any legalese; perhaps my favorite part was the reveal of the theoretically geographically unlimited reach of the demon. This isn't new—Wan's own Paranormal Activity used it to good effect—but usually demons in these movies are at least bound to something. There is a moment when a person and place that should not only be safe but entirely incidental to the unfolding story each prove to be just as vulnerable to the demon's power. There are a hundred other, smaller touches that Wan and the Hayes brothers use make this satanic stalking interesting. And it's not a Blumhouse movie, so none of them is contractually required to be creepy kid art. Ultimately the fundamental problem is the ending—for some it may work, for me it didn't do much of anything. Still: though easily digested and prone to proselytize, I'm happy to concede that there is yet a great deal to enjoy in The Conjuring. "How good? Well, I'm Catholic and married to Vera Farmiga. So good." Read no further lest ye be spoiled, there be plot reveals ahead. For those pure of heart and stout of constitution, or who just don't give a hoot, I'll nonetheless give you a moment to recalibrate your tolerance. The Conjuring, almost obviously, ends with an exorcism. This climactic scene is staged wonderfully, with true high intensity, but at the last moment it pulls a crucial punch and rescues all of our victims from the bleak inevitability of death and/or hellfire. Jesus saves? Not exactly; he's buried in paperwork. But what does happen is just as weak, and feels nearly as unearned. It's not even, or not just, that everyone lives, but more the notion that they'll live happily ever after, without even so much as a hint of lifelong psychological damage, maybe at best the vague prospect that some EPA official, who may or may not be dickless, could shut down the Warrens' containment unit at some unspecified point in the future. The end result? The Conjuring is fine, but like Insidious, while it may have its terrifying turns, it won't stick with you forever—or even overnight. And I don't know if this necessarily says anything about the upcoming Insidious 2, but it does make it all the more a shame Derrickson's new picture is two years away, you know?